For David Deutsch, a young physicist of unusual originality, quantum theory contains our most fundamental knowledge of the physical world. Taken literally, it implies that there are many universes ';parallel' to the one we see around us. This multiplicity of universes, according to Deutsch, turns out to be the key to achieving a new worldview, one which synthesizes the theories of evolution, compu… tation, and knowledge with quantum physics. Considered jointly, these four strands of explanation reveal a unified fabric of reality that is both objective and comprehensible, the subject of this daring, challenging book. 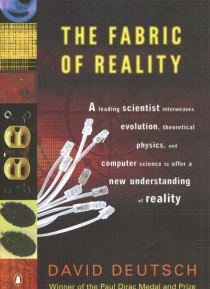 The Fabric of Reality explains and connects many topics at the leading edge of current research and thinking, such as quantum computers (which work by effectively collaborating with their counterparts in other universes), the physics of time travel, the comprehensibility of nature and the physical limits of virtual reality, the significance of human life, and the ultimate fate of the universe. Here, for scientist and layperson alike, for philosopher, science-fiction reader, biologist, and computer expert, is a startlingly complete and rational synthesis of disciplines, and a new, optimistic message about existence.